Nick Cross always listens to the voice in his head. Because if he doesn't? Things can go really, really wrong. Like the day he decided to go off script and saved a girl from being run over . . . and let another one drown. Trying to change the future doesn't work. But this summer at the Jersey Shore, something's about to happen that Nick never could have predicted. He meets a girl named Taryn and finds out about the Book of Touch. Now the path that he thought he was on begins to shift . . . and there's no way to stop things from happening. Or is there? In a life where there are no surprises, nothing has prepared Nick for what he's about to discover--or the choice he will be forced to make. . . . If I could be granted one wish involving Touched, it would be to crawl into its pages so I could give Nick a big hug. I love that the male lead character is not your average bad boy, smooth talking, ladies' man. Quite the opposite. Nick Cross is an outcast. He’s been bullied and then avoided like the plague. His “talent” is no gift, but indeed a curse. A huge burden that weighs on his every waking moment. I couldn’t imagine having a script in my head that I must adhere to every second of my life. And if Nick goes off script? A painful re-shuffling of his future. To know who you marry, how you will die, even to fall in love with a future grandchild….. Only to have it all vanish in an instant, because for one tiny moment - you disobeyed the script. What an incredible and thought-provoking concept! I love the magic of Touched. The You Wills were amazing and fascinating to read about. Nick was so endearing that he captured my heart within the first few pages. His family (especially his Nan - LOVE her), his home life, his thoughts - so extremely absorbing. I wasn’t sure about Taryn in the beginning, but the answers that she was able to give and the history provided by her grandmother’s Book of Touch were so intriguing. My only regret is the turn the story took near the end. While I appreciated the sacrifice that was made in the end, I would have liked for it to have stayed on the path it started, but that’s just my personal preference. I still thoroughly enjoyed this book and the fact that I couldn’t stop thinking about it for days after I turned the last page. The cover is beautiful and relates to the story itself perfectly. 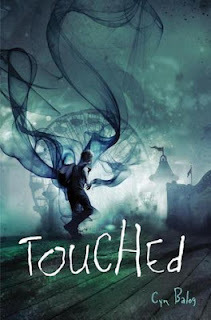 Touched has definitely earned a spot on my bookshelves, and Nick Cross - a place in my heart. I look forward to reading Ms. Balogs’ other works. Thank you to Delacorte Press and Netgalley for providing me with an ARC of this book. Wow this book sounds interesting to say the least! I have a copy and know I am anxious to meet Nick. I love male protagonists and Nick sounds comoletely different. I am worried though about the ending. Still I love that you were thinking about it for days afterwards. I love the cover and this book sounds amazing. Now I want to meet Nick and I am curious about the ending..darn you! Adding to my list! Isn't the cover fabulous? And it fits the story so well! Hahaha! Well, consider it payback for all the books your reviews have put on MY reading list! LOL! Heart you! this sounds very interesting. I think reading a book in the males perspective is cool since I have read very few books like that. It also sounds like a very different concept. I'll have to add this one to my list also :) Great review!